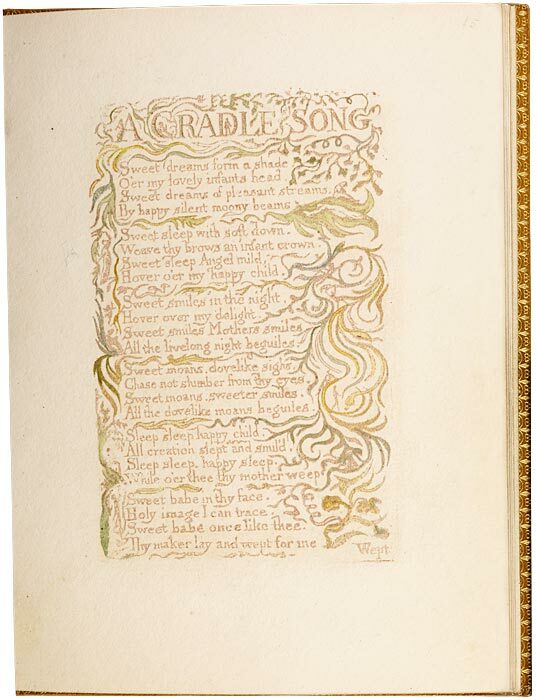 Songs of Innocence is one of Blake's earliest illuminated books, printed by a relief etching process of his own invention. His novel printing methods assured the artistic integrity of his work, giving him complete control over the production of his limited editions and the configuration of word and image, rendered in the same medium to form an inspired synthesis of his visionary ideas. Twenty-six copies survive. One of sixteen printed in yellow ochre and raw sienna about 1789, this copy was hand-colored by Blake around 1794 for his friends Anna and John Flaxman, a prominent sculptor and illustrator who shared some of his stylistic traits and artistic views.